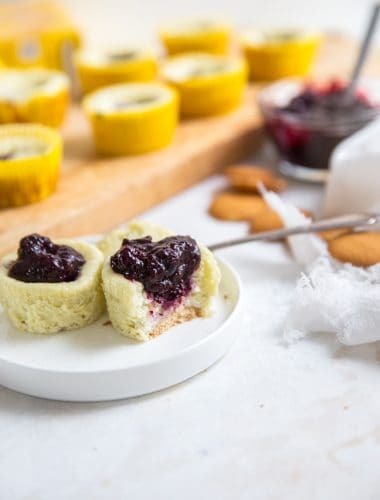 Mini lemon blueberry cheesecakes are the perfect 2-bite treats for spring! 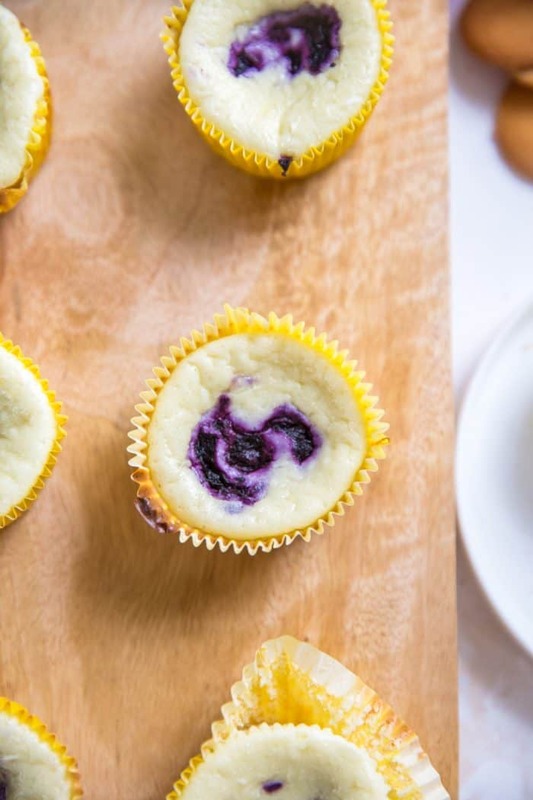 Each mini cheesecake is filled with a blueberry swirl and a simple blueberry topping! Lemon and blueberries together are one of my favorite combinations! 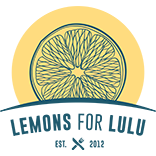 The sunny, bright taste of lemons seems to make the sweet, taste of blueberries pop. When these two flavors collide in a creamy cheesecake, then you have yourself a dessert that is bursting with freshness! What is a Lemon Blueberry Cheesecake? 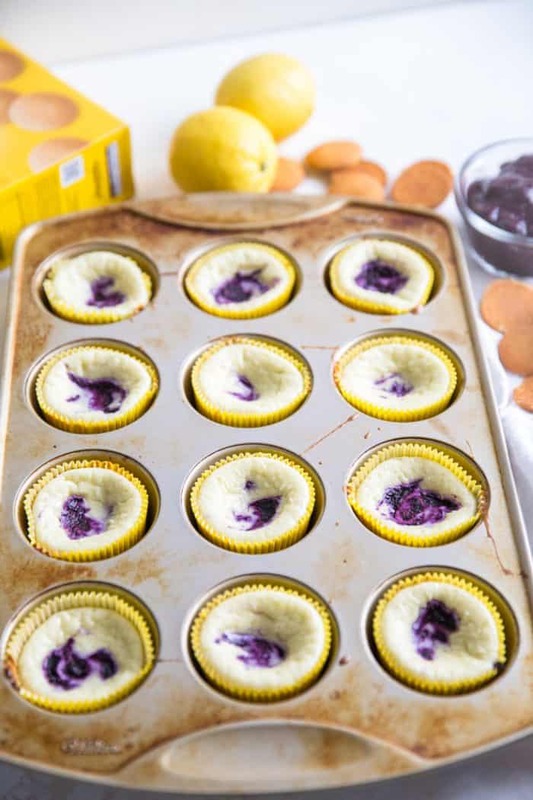 A lemon blueberry cheesecake takes a simple lemon cheesecake recipe that is baked in a muffin tin instead of a springform pan. A Nilla Wafer cookie takes the place of the usual graham cracker crumbs as the crust for each cup. 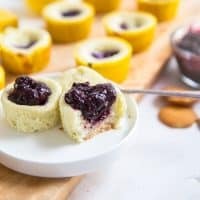 These little mini cheesecakes have swirled blueberries in the center that pops in your mouth. 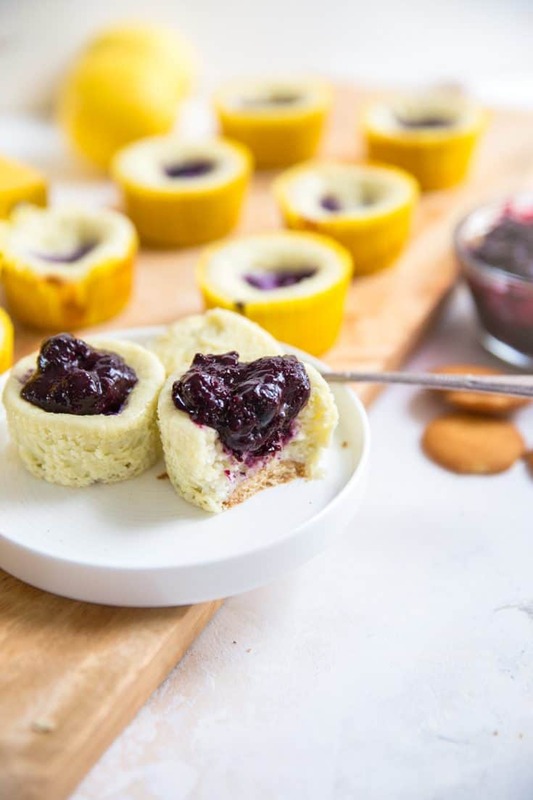 A homemade, lemon infused blueberry sauce is served with each individual cheesecake for the ultimate blueberry experience! 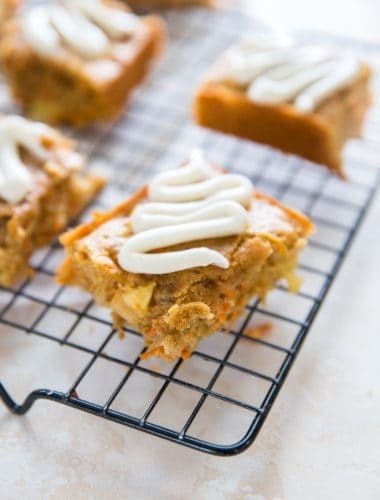 These little cakes are two-bite treats that come together quickly, but more importantly, they taste amazing! 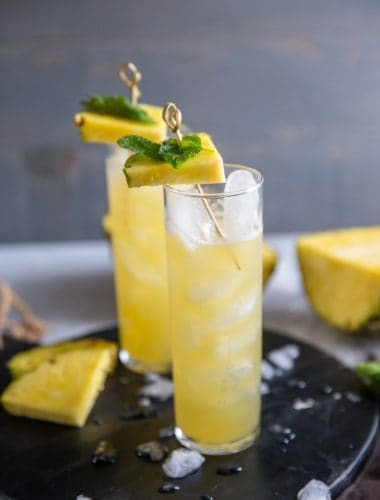 I’m excited to share this recipe with you today, I think it is such a great recipe for Easter or spring. 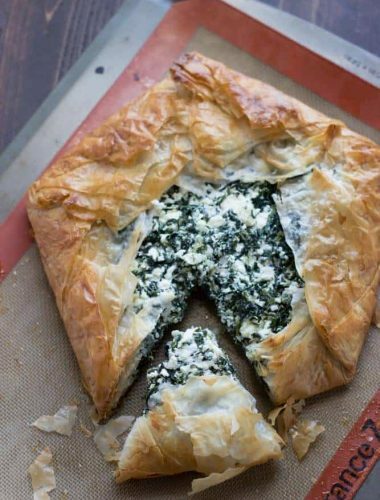 This recipe works well for summer too, especially if you can get your hands on fresh blueberries! 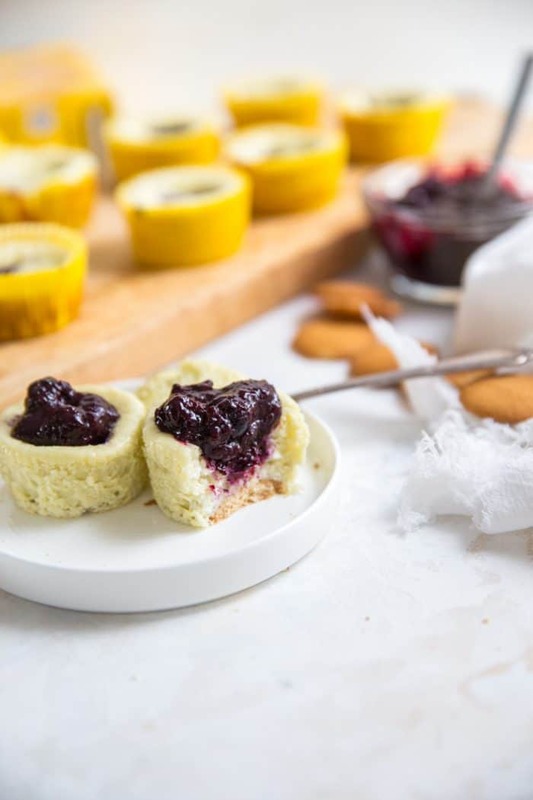 This recipe is pretty easy and the fact that these cheesecakes are mini makes them pretty quick to prepare! 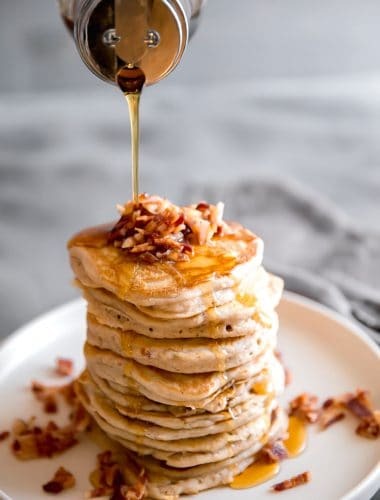 Most cheesecake recipes that you come across use a graham cracker crust, however, this recipe keeps things especially simple by using Nilla Wafer Cookies as the crust for each mini cheesecake. How’s that for time-saving? 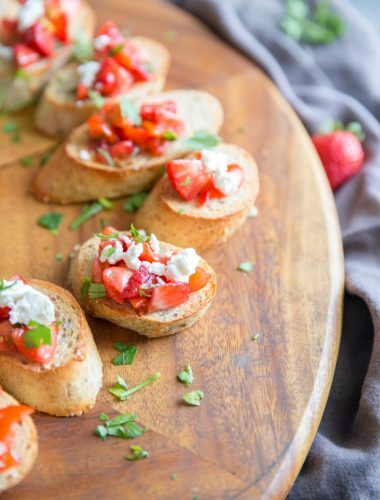 Plus the Nilla Wafers add a touch of sweetness to this colorful and flavorful recipe! This recipe starts by lining a muffin pan with liners and place 1 Nilla Wafer cookie face up in each cup. Set the pan aside while you prepare the blueberry sauce. In the bowl of a stand mixer, beat two 8 oz blocks of cream cheese and ¾ cup of sugar until smooth. Beat in one egg at a time until incorporated. Add lemon zest and fresh lemon juice and divide the batter between the prepared cups. Take half of the blueberry sauce (see below) and divide it between each cheesecake and gently swirl with a knife. Bake the cheesecakes for about 20 minutes or until set, the centers should look soft, but should not wiggle. Allow the cheesecakes to cool in the pan on a wire rack. Note: the cheesecakes will probably sink a bit in the center. Do not be alarmed! The blueberry topping will make up the difference. Place 2 cups of blueberries and 1 tablespoon of cornstarch in a food processor until combined. Pour the blueberry mixture into a saucepan and bring to a boil over medium heat. Then stir until the mixture has thickened. Remove from heat and allow the blueberries to cool. Half of the blueberry sauce will get divided and be swirled into each mini cheesecake. Return the remaining blueberry sauce to the stove top. Add a touch of lemon juice and lemon zest and add ½ cup of fresh blueberries, stir until combined. Cool the sauce before serving. Place the sauce in a small bowl to be served on the side of each cheesecake. 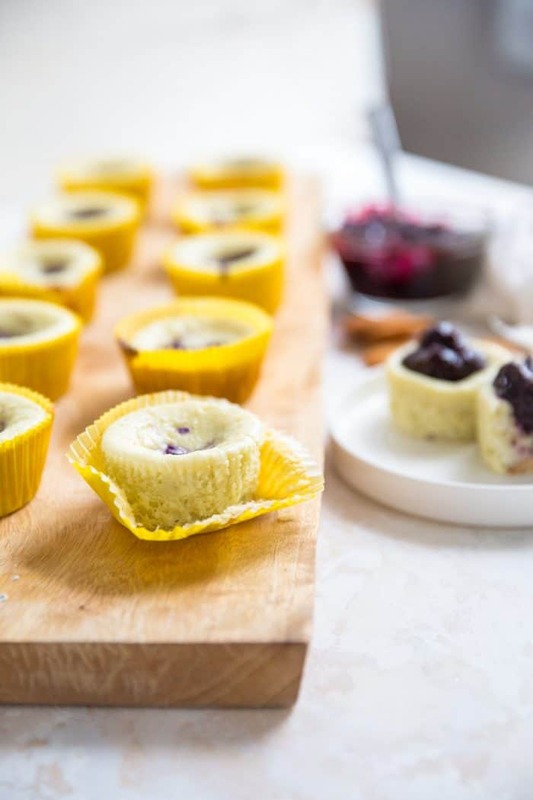 Before freezing, allow the cheesecakes to cool in the pan completely, Cover the muffin pan or remove the cheesecakes to an airtight container and place them in the freezer. 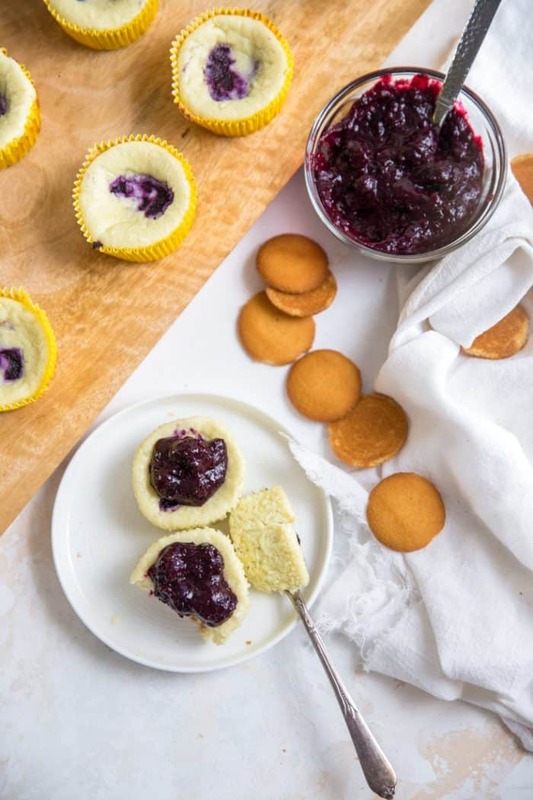 When needed, allow the cheesecakes to thaw in the refrigerator and then serve with the blueberry sauce as normal. Frozen blueberries can be used in place of fresh blueberries in this recipe. As mentioned above the centers will sink once the cheesecakes are removed from the oven because of the temperature change. To avoid this, allow the cheesecakes to cool in the oven with the door ajar. I liked the sunken center as it holds my sauce nicely. 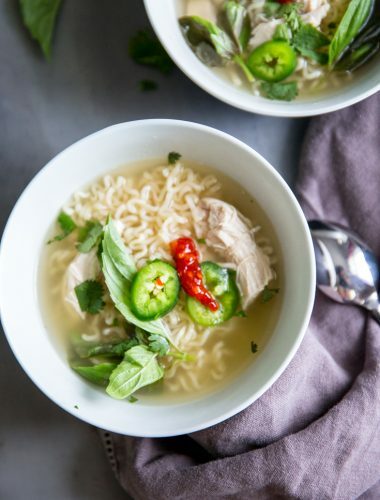 You do not need a water bath for this recipe. 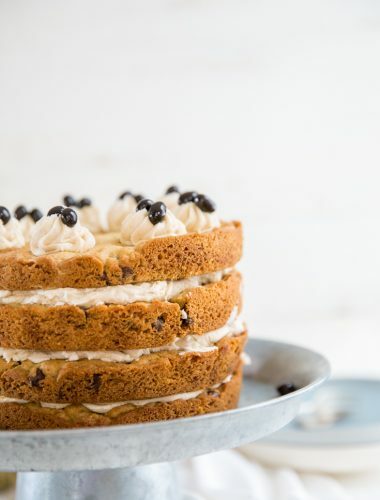 Each blueberry can be served with a side of whipped cream. 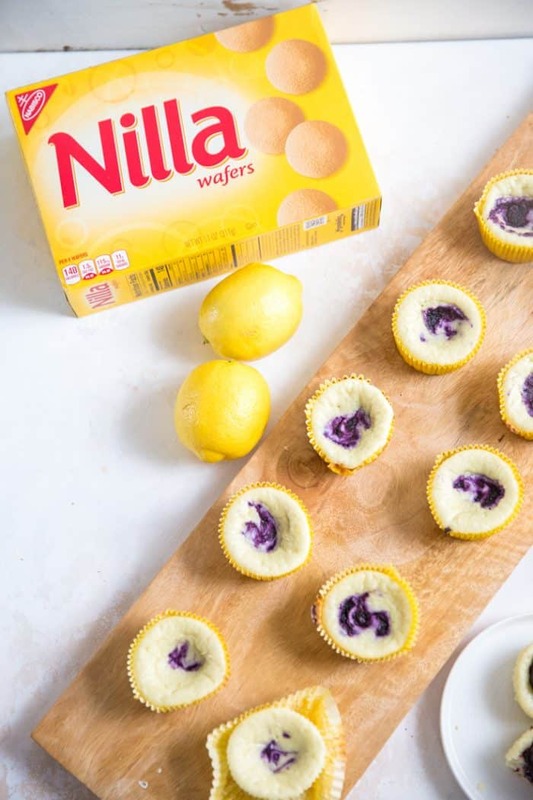 If you want to get really fancy, decorate each mini cheesecake with a Nilla Wafer cookie or a lemon wedge prior to serving. Store these cheesecakes in an airtight container in the refrigerator. 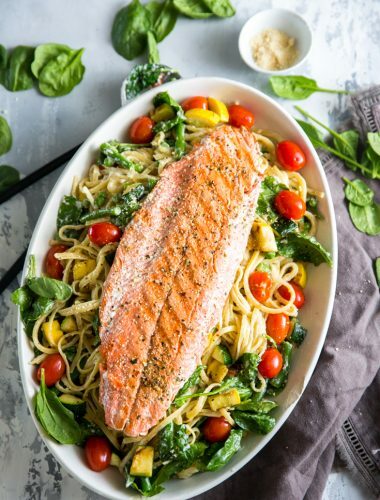 Make sure that you store the sauce in a separate airtight container. Cheesecakes will be good for up to 2 days when stored properly. Find Nilla Wafer Cookies at your local Kroger (or Kroger brand of stores). Love cheesecakes? Then you have to try these Mini Banana Cheesecakes, Strawberry Lemonade Cheesecakes, and these Chocolate Mint Cheesecakes! 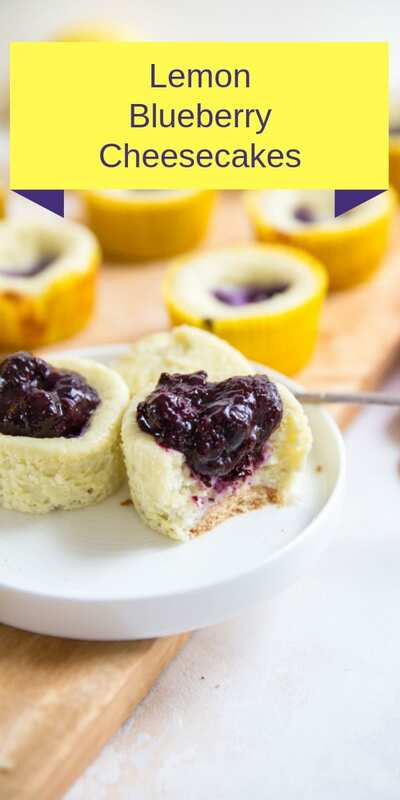 Mini lemon blueberry cheesecakes are creamy and have a blueberry swirl baked in as well as a blueberry sauce to serve on top! 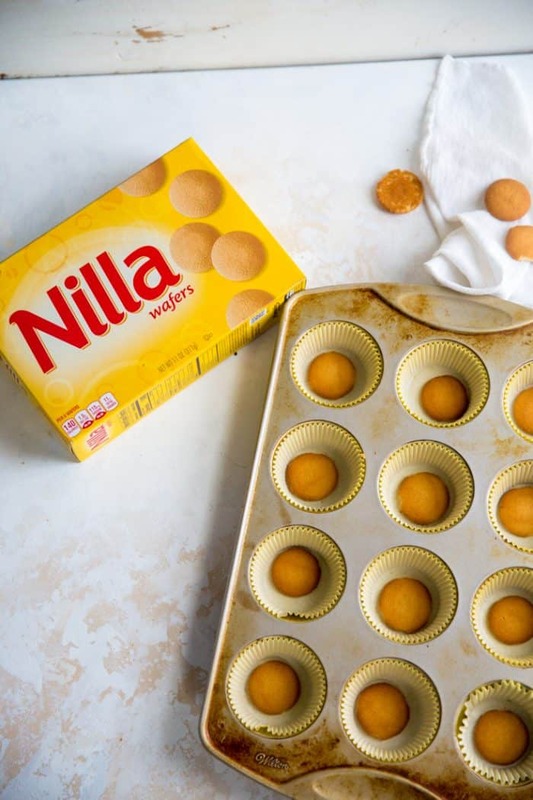 Line a 12 cup muffin tin with cupcake liners and place a Nilla Wafer cookie in the bottom of each cup. Place 2 cups of blueberries and 1 tablespoon of cornstarch in a food processor and pulse until smooth. Pour puree into a saucepan and place the saucepan over medium heat. Bring berries to a boil and cook until thickened (about 6 minutes), stirring often. Remove berries from heat and cool.In a mixing bowl, beat cream cheese and sugar until creamy. 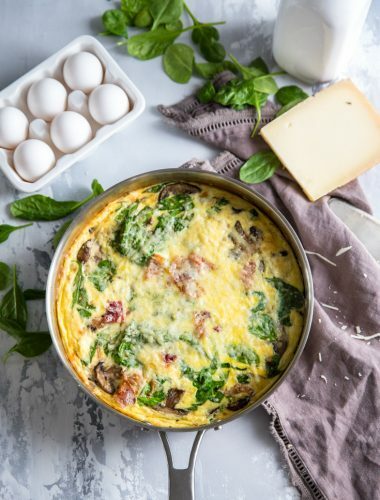 Blend in eggs one at a time until combined. 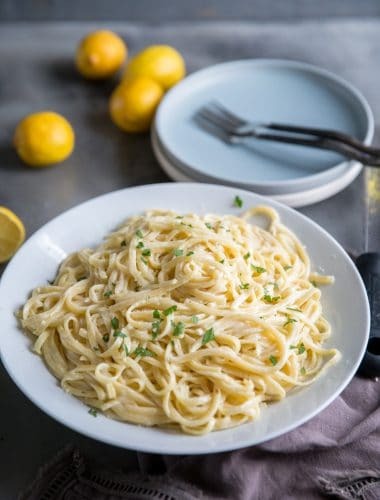 Beat in cornstarch, vanilla, lemon zest, and juice. Divide mixture between the muffin cups.Divide the berry mixture in half. Divide one half between the mini cheesecakes, swirling with a knife. Bake the cheesecakes for 20 minutes or until set. Remove the cheesecakes and allow them to cool. Before serving, place the remaining blueberry sauce over medium-low heat. Stir in lemon juice, zest and remaining ½ cup of blueberries; stir. Serve reserved sauce with mini cheesecakes.